The Perth Mint of Australia has released a high relief coin featuring one of the most iconic creatures found in the country. The 2012 Australian Kangaroo 1oz Silver Proof High Relief Coin is available now from the Perth Mint for AUS $100. As indicated by the name, the reverse of the coin features a design showcasing a kangaroo. Each one ounce coin is struck to high relief from 99.9% pure silver and features a thickness of 6.00 mm. Kangaroos are endemic to Australia and have long been considered an iconic animal of Australia. Their use on coins of the nation also dates back through the years. 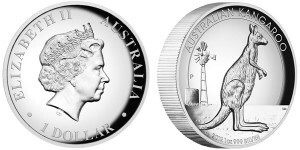 However it was not until 2010 that the Perth Mint chose to create a 99.9% pure silver kangaroo coin. In that same year, the Perth Mint released the first coin of this high relief Kangaroo series. It was followed a year later with the release of the second coin of the series, the 2011 Kangaroo High Relief Coin. This 2012 Kangaroo Coin now appears as the third issue of the high relief series. Like the two coins before it, it is struck from the aforementioned .999 fine silver. 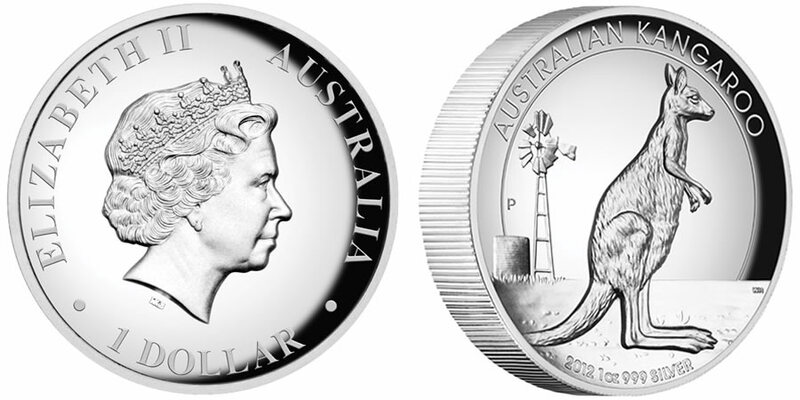 The design on the reverse of the 2012 coin depicts a kangaroo placed in an Australian bush scene. Behind the marsupial, a windmill and a water tank can be found. Reverse inscriptions include "AUSTRALIAN KANGAROO" and "2012 1 oz 999 SILVER." These coins are struck as legal tender of Australian and, as such,showcase the Ian Rank-Broadley effigy of Queen Elizabeth II on the obverse. Surrounding the obverse portrait are the inscriptions of "ELIZABETH II," "AUSTRALIA" and "1 DOLLAR." The Perth Mint indicates these coins have an extremely limited mintage of just 20,000 worldwide. Each comes housed in a black display case and ships with a numbered certificate of authenticity inside an illustrated shipper.